EAST RUTHERFORD, N.J. (AP) — A smiling Rex Ryan reached up and high-fived fans on a victory lap around MetLife Stadium with his team. The New York Jets coach wanted to say thanks. Whether it was also a goodbye remains to be seen. 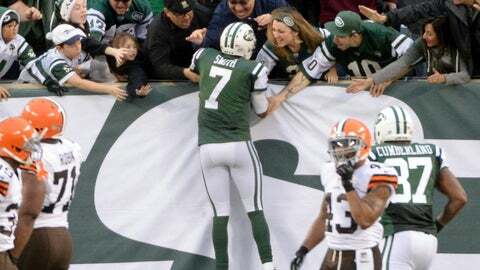 With Ryan on the hot seat, Geno Smith threw two touchdown passes to David Nelson and ran for another score as the Jets topped the Cleveland Browns 24-13 Sunday in their home finale. "I told you this team’s on the climb, it’s on the rise," Ryan said. "I think it was pretty clear, at least to me, that that’s what we saw today." Ryan wasn’t interested in discussing his future, and the Jets (7-8) showed no signs of a team simply playing out the string. "I think everybody kind of looked at it like this was our AFC championship game and our Super Bowl will be in Miami (next Sunday)," linebacker Calvin Pace said. "Just finish strong. That’s all you can do." Chris Ivory rushed for 109 yards on 20 carries for the Jets, who were eliminated from the playoff picture last week. Nelson, cut by the Browns after training camp, finished with four catches for 33 yards. Jason Campbell was intercepted twice as the Browns (4-11) lost their sixth straight, and the offense was clearly hurt with star tight end Jordan Cameron out with a concussion. Things just started to unravel today, the whole thing that’s been happening over the last month. Edwin Baker had a touchdown run, and Josh Gordon was somewhat held in check by rookie Dee Milliner, catching six passes for 97 yards. "Things just started to unravel today, the whole thing that’s been happening over the last month," Campbell said. "Being so close and not finishing it, I think is kind of pressing on guys. We just want to win so bad." New York took control with a drive of over 6 minutes capped by Smith zipping up the middle for a 17-yard touchdown, his fifth rushing score, to make it 24-13 with 3:19 left. Ed Reed intercepted Campbell in the closing moments to seal the win. "We were picked to be the worst team in the NFL," Pace said. "It says a lot about this team’s character and the way we rallied under Rex. I guarantee you everyone loves playing for Rex." REX’S FUTURE: Ryan wouldn’t address a published report that he told his players at the team meeting Saturday night that the "word on the street" is he’s out after next week’s game at Miami. "What I do know, guys, is that I’m coaching this team and my job is to focus on the present, what’s right now," Ryan said, adding that he doesn’t know if he’ll be back for a sixth season. None of the players would touch the subject, but many voiced their support for their coach. "I think Rex needs to be back," guard Willie Colon said. "This team is headed in a great direction. He’s our general. We love him. We bleed for him and he bleeds for us." GOOD GENO: Smith was 20 of 36 for 214 yards and also ran for 48 yards — including the 17-yard scoring scamper in the fourth quarter. Smith had his first game with at least two TD passes since Week 5 at Atlanta on Oct. 7. 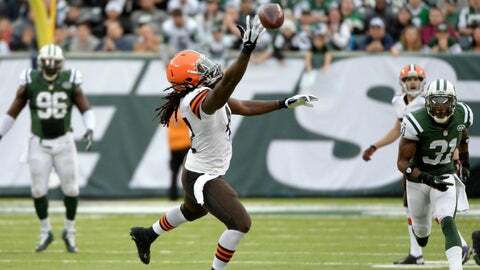 "No turnovers for him, so I guess he put his foot in my mouth," Browns safety Tashaun Gipson said. "I have nothing but respect for him after this game." The Browns are 0-6 since. They led 10-0 in this one, but allowed the Jets to tie it with two scores in a span of 78 seconds just before halftime. Gordon and Greg Little dropped potential touchdowns, and a TD run by Baker was nullified by a false start penalty on Gary Barnidge and Cleveland had to settle for a field goal. KEEPING DRIVES ALIVE: The Jets converted 12 of 18 third-down opportunities, wearing down the Browns’ defense that came in ranked eighth overall. Four of New York’s third-down conversions came on the drive capped by Smith’s touchdown run — which also was on third down. The Jets finished with 422 yards, compared to the Browns’ 283. Cleveland went just 5 of 12 on third downs. NELSON’S SPECIAL DAY: Beating the team that cut him earlier this year wasn’t even the best part of Nelson’s weekend. The Jets wide receiver hosted Davion Only, the 15-year-old Florida foster boy who made headlines with his heartfelt adoption plea in October, for a memorable weekend that included stops all over Manhattan on Saturday and MetLife Stadium on Sunday. "I think the way I played today, I hope it made him proud," Nelson said. "I hope it brought joy to his life."